If you’ve logged in to your Akismet account within the past week or so, you’ve probably noticed quite a few changes. We’re happy to announce some updates to your account dashboard, which will make it easier to manage your Akismet subscription. The most significant update to the dashboard is an active site listing, which will display each site that has used your API key within the past 90 days. Each site is linked to its dedicated stats URL, which details specific usage. If you have numerous active sites, you can use the handy new search feature to quickly locate one of your URLs. This all makes it possible to know where and how your subscription is being used at any given time. In addition to this new stats goodness, the billing information (for users with premium subscriptions) has been moved to a unified section where you can quickly access your transaction history and receipts. This greatly reduces the amount of scrolling that your old dashboard required. We’ve also added a new Support section with some links to a few popular support documents and an option to get in touch with our Happiness Engineers. Oh, and the whole thing has been given a fresh coat of paint, as well. So, log in and take a look. We hope you enjoy these changes and always welcome your feedback. If you notice any problems or have suggestions, please don’t hesitate to get in touch. And because we like to keep the goodies coming, look out for a forthcoming update to our stats pages! 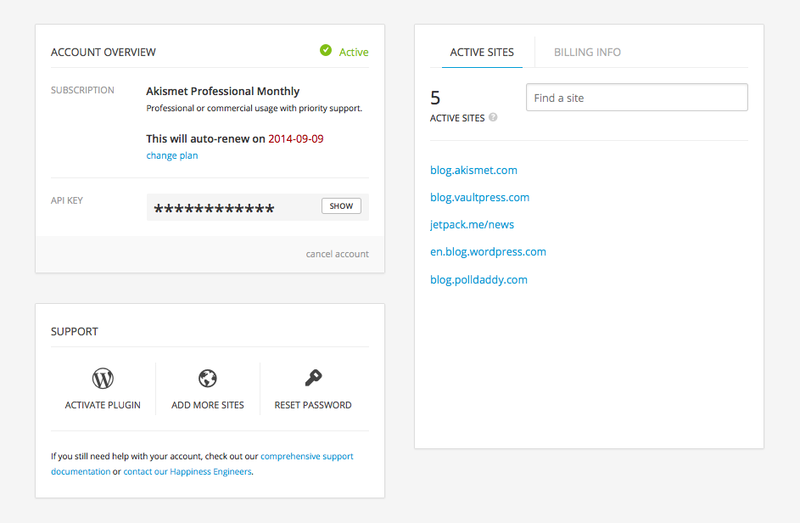 The new layout looks great – and I especially like the active sites feature to see where my account is in use.